Well the Images reminiscing continues! Thanks to Tammy Howden for sending me this pic through. 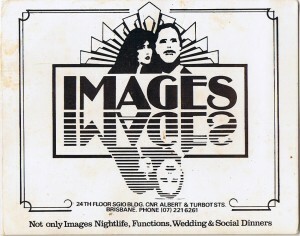 Images was Tammy’s favourite haunt in the 80′s. Tammy and George met at there when they were 18. 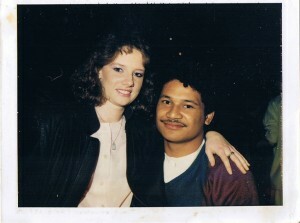 They have been happily married for 28 years now! They still have a huge vinyl collection from the era (I think a lot of us do!) and would love to find out what happened to people they used to meet up with there. Here’s the pic of the happy couple at the club they loved. If you have a pic or something you’d like to see in Clubbed Out let us know. This entry was posted in 1980's, Clubbed Out, Clubs and tagged Images. SGIO. Bookmark the permalink. I remember you, i was the GM for Images, Sybils and Hot Gossip for many years. I’ll have to go through my pics, have thousands of them (scary thought). I too used to frequent the Top Of The State with my first husband, my boyfriend in those days, we also celebrated our engagement there with his parents on the revolving floor. We would go there every Saturday night for the supper menu which included prawns and was obviously cheaper and a way of soaking up the atmosphere and having a dance on a regular basis. We also frequented the cafe on the ground floor, I for the life of me cannot remember the name of it, but am sure it had American something or other in the name. Fond memories, these were the days when it was hard to find anything open in Brisbane past 6pm. Also saw Billy Thorpe play, what was really just one long jam session, at once again I thought the club was named The Electric Circus, it was in Elizabeth St, it was where the back entrance to the Myer Centre is now. Does anyone else remember these venues? Just wondering when the Electric Circus was around? Hi, great to see photos of the old Images. I was the head chef there from 1980 til 1984ish, lots of great memories, i still have a champagne bottle with the images label on it. I was there the night little river band played for the first time with John Farnham as lead singer. Big Night. All the staff were great we all got along well, after finishing work at 3am we would all get into Michael Bishop’s combi and drive down to Byron Bay for the day and drive back in time for work. It would be great to hear from any other ex staff or customers. Clubbing between 84-90 started at the Italian club Newmarket. And group of boys with Italian background were known as the Glamour Boys especially at hot gossip. Sybil’s,reflections,whispers,stratos,images , underground were the hot spots. There are many memories. I will mention a couple for now, and next time I say more. The music st images and reflection were the best playing funk. Sunday nights at images place funk only .we got dressed up in suites .only wogs could be do vain.the girls loved it. The blue bar at images were I made Greek friends. I wonder if your remember at Sybil’s there was a competion to win a Jaguar car.a lady won it. I think it was rigged.